What do technology and toilets have in common? AMMACHI Labs has found a way to use technology to address some of India’s biggest challenges: water safety, sanitation and hygiene. The Government of India has recognized that safe water and sanitation are vital to the nation’s survival, mandating that open defecation should be eradicated in India by 2019. Because unsafe water and lack of sanitation is a major cause of disease and health hazards in rural villages, researchers at AMMACHI Labs are finding impactful solutions through their field work in the Amrita SeRVe Villages. It is a well-documented fact that the most effective tool for development is the empowerment of women. 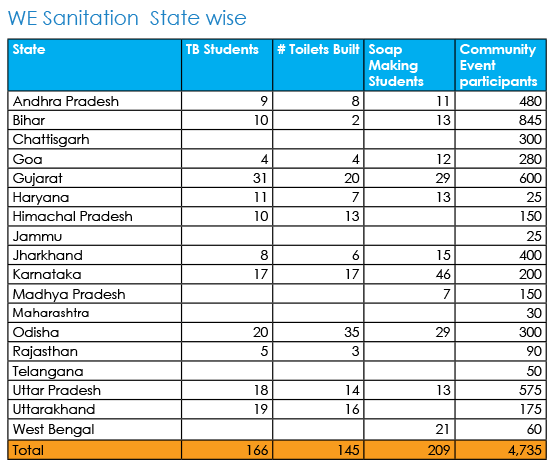 To address the lack of toilets in the country, AMMACHI Labs brings vocational courses to women across India through the Amrita SeRVe program. The Rural Toilet Builder course teaches women basic plumbing skills, allowing them to construct, install and maintain toilets. The course is deployed through tablets, using a computerized vocational education training (cVET) model. An important part of AMMACHI Labs’ work in villages involves self-empowerment and the building of self-confidence, particularly for women. As part of the LEE project—Life Enrichment Education—the teams engage with villagers in spiritual and emotional education, allowing women to learn how moral values can enable continued empowerment. LEE courses emphasize issues such as alcoholism, human trafficking prevention, cleanliness practices, environmental awareness and many other important values. Community events such as cleanups and rallies are often organized through AMMACHI Labs in the villages. Besides water safety and sanitation, Labs teams across India also brings basic programming and computational thinking to villages through serious games for the younger generation. Tomorrow’s aspiring engineers, computer programmers or scientists are also in the hearts of India’s villages. AMMACHI Labs’ DIY robotics camps allows students to build robots from post-consumer materials and gives students a tangible platform to learn technical skills. Instead of seeing technology and humanitarianism as separate entities, AMMACHI Labs strives to design solutions around people where humans and machines meet.